The word "prop" is shorthand for "property" - referring to things, items, or objects on the set that are part of the design and production of a film. The variety of props may be endless -- maps, masks, traps, machines, visual gag items, costuming parts, tools, weapons, furniture or artwork, unique animals/creatures, valuables, character references, MacGuffins, symbols, mementos, the subject of the film, and even a character in itself. The greatest movie props evoke a sense of nostalgia and cultural relevance, and a well-selected, recognizable and iconic prop can serve as a symbol for the entire plot of a film. The vast number of cars, costumes, and guns as props has limited their comprehensive incorporation into this list. Also, movie props should be objects that are tangible, therefore, there are no animated props, such as Snow White's Poisonous Apple, or Shrek's Gingerbread Man, or predominantly visual-effects creations. When first seen on-screen, some props are often overlooked as mere objects that are just part of the story. No studio or film viewer can be certain which items will become the most sought-after and valuable in the future. Movie props and movie memorabilia have become some of the most sought-after and valuable commodities on the market. 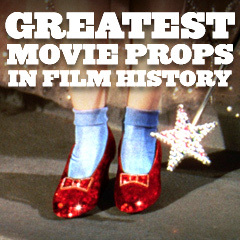 There are prop shops today that sell almost every imaginable item from a film's production, but of course, the most valuable ones are one-of-a-kind and are worth millions.